Over the last couple days, my social media feeds have been filling up with delightful engagement announcements. Tis’ the season when joy, hope, and love are in the air. My husband Bernard and I got engaged around this time of year three years ago, and I can remember that exciting feeling and how much I had been looking forward to that moment. I can recall days, weeks, even months after catching myself in a daze just staring at my ring and smiling. It felt so weird wearing the ring on my finger having gone my entire life wearing nothing on that hand. The ring was a symbol of the commitment and the love Bernard, and I felt towards one another and also that we were ready to take our relationship to the next level. The picture we took the night we got engaged. Fast forward to today, three years later and I think about how many times I put on my engagement ring without giving it a second thought. I slip it onto my finger after my wedding band and sometimes don’t even remember doing it, although now if I don’t wear it, I feel like something is missing. Getting the ring was such a big deal, and now it has become just something I put on going through the motions in the morning when I am getting ready. I felt a twinge of guilt thinking about this, why doesn’t my ring put me into a giddy daze like it did in the beginning? I tried to remember the exact point when my engagement ring stopped giving me such a thrill, but I can’t. I then tried to think of the possible reasons for this to occur and after some reflection, I came to a conclusion. Before I tell you this conclusion, I feel I must clarify one point. 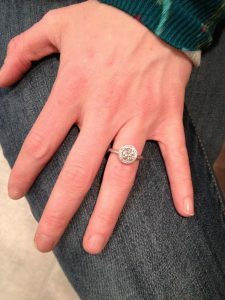 Please don’t mistake what I am saying to mean that I don’t like my engagement ring because that is simply not true – my feelings towards its beauty and the sentiment behind it has never wavered. My engagement ring and wedding band today. The conclusion I have reached is this, the day you become engaged will no doubt be a happy moment for you and your now fiancé, but it is only the start to the happy moments you will come to share. 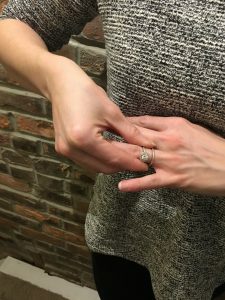 Now after being married for one year, I can say that my husband and I have shared many exciting moments since he initially popped the question which is why I believe the engagement ring I wanted for so long has now become just a part of my daily routine. I don’t think this is a bad thing; it demonstrates that you are not holding on to that one moment in your relationship as the highlight with which to compare all other moments. I did learn from my reflecting that I should take the time to pause every once and awhile and recall the feelings I had when I first got engaged and what the ring stood for regarding Bernard and I’s relationship. If not for anything else to remind me of how far we’ve come and all the beautiful moments we’ve shared. I believe time can cause some to become desensitized to these memories in their lives – we lose sight of those first joyous moments in our relationship either because we replace them with better ones or because troubles we encounter with our spouse elicits forgetfulness. Taking some time to reflect on the memory of when you got engaged could help you gain perspective on your relationship and reignite the love and admiration you feel for your partner. This entry was posted in Wives.